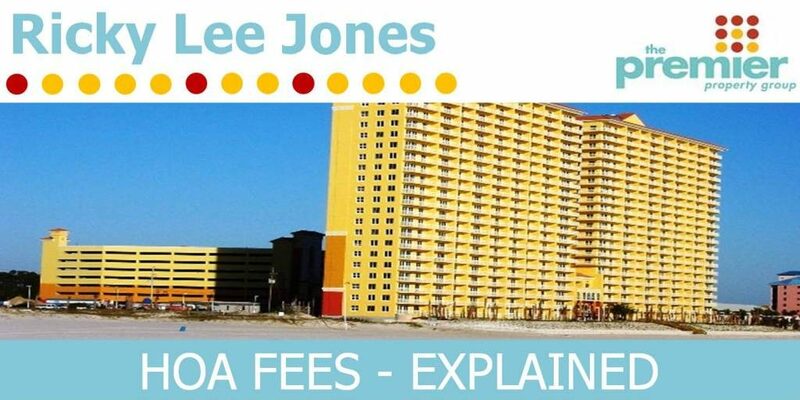 HOA Fees and How Can I Afford My Vacation Home in Florida? This is the #1 question that I always receive from my prospective 1st time vacation home buyers. When I tell them the HOA fees are $350 – $600 per month, the 2nd question immediately out of their mouths is “How in the world can we afford to purchase this property and then pay THAT MUCH MONEY for HOA fees”? Well, I’m not suggesting that HOA fees for beachfront properties in Florida are inexpensive, as they are not. But, believe it or not, I am usually able to answer these two questions to the satisfaction of most of my clients and this becomes much less of a psychological barrier to their potential vacation home ownership. Let’s see if you agree! First of all, the term “HOA Fee” refers to the monthly or quarterly dues that are paid to a homeowner association in order to cover the shared expenses incurred by the overall community or resort. These typically cover the costs for shared amenities like swimming pools and fitness centers, common facilities like parking garages and elevators, and on-going maintenance such as landscaping and exterior building repairs, plus shared utilities and insurance. WHY ARE HOA FEES SO EXPENSIVE? So then, why are the HOA expenses for a resort condominium on the Gulf in Panama City Beach so much more than a townhouse in a golf community in Tennessee, for example? Well, there are several reasons, with the most obvious being the cost of insurance. Insurance: Many HOA communities have insurance to cover the exterior of their buildings and also common areas. However, most of these properties do not have to worry about purchasing additional and very expensive hurricane and flood insurance, which is the largest single portion of the HOA fees for waterfront properties on the Gulf of Mexico. Building Maintenance: Another major HOA cost is related to the expenses required to keep all of the buildings and shared infrastructure adequately maintained. The exposure to salt and wind takes it toil on buildings near the Gulf. Amenities: Unlike most small residential complexes with a shared pool and maybe a clubhouse, these resorts often have multiple pools, hot tubs, large fitness centers, game rooms, theater rooms, saunas, tiki bars, etc., which all require upkeep and maintenance and potentially additional insurance. Shared Utilities: Small residential HOA’s typically only provide the owner’s with free water service. However, most of the new resorts in Panama City Beach also provide their owners with free cable TV and high-speed wireless Internet service (valued at over $150/mo. in most locations). HOW CAN I AFFORD THE HIGH HOA EXPENSES? Hopefully, you now have a better understanding of why the costs are so much higher for a luxury Gulf front resort community and you can also see that the property owners here do typically receive more benefits from their HOA than a standard residential HOA community. But, the question is still “How can I afford these higher costs”? The simple answer is RENTAL REVENUE! I try to put the HOA cost differential into perspective for my clients by relating it to a golf course community townhouse that I owned and managed as a rental property in Murfreesboro, TN. My HOA fees were only $160 per month and included exterior building maintenance, water, landscaping, and access to a community pool and tennis courts. However, my annual gross rent for this property was only $14,400. In comparison, my Sunrise Beach Resort 2BR condo HOA fee is $550 per month but I also receive free cable TV, high speed wireless internet, and have a great fitness center, heated year-round pool, and outdoor jacuzzi’s. But, more importantly, my condo returned $36,000 in gross revenue! CAN YOU AFFORD TO OWN YOUR OWN GULF FRONT VACATION PROPERTY? My goal is to help each of my prospective buyers make that determination and feel comfortable with their decision. I am able to do that by taking advantage of my own 10-years of vacation condo ownership, 8-years of vacation rental management in Panama City Beach, and more than 3 years as one of the top producing real estate agents on Florida’s Emerald Coast. I have some excellent tools that allow me to prepare a customized 10-year investment spreadsheet specifically for each property that they might be interested in. And, I give them the flexibility to plug in their own forecasts for inflation, increases in rental revenues, and especially their own projections for property appreciation. For some people, this quickly shows that vacation ownership may not be feasible for them at this particular point in time. But, in many cases, it reinforces the gut feeling that my buyers felt like it was a great investment for them. If you have any questions about HOA fees, vacation property investing, or just want to discuss certain properties and communities on here on the Emerald Coast, give me a call at 850.290.2901. Or, email me at Ricky@RickyLeeJones.com.